It’s safe to say that you have come to our website because you want to improve your life in some way. You might be dealing with a specific problem like: low back pain, neck pain, shoulder pain, or maybe a slipped disc. Maybe you’re dealing with fatigue, low energy, or tiredness. Possibly, you’re worried about your posture or your weak immune system. You may be an athlete, looking to improve your game. You might be in research mode, wondering if chiropractic is the right option for you. We like to think of ourselves as a team of guides. We are successful when we help you get what you want in your life. Let us guide you in restoring your health. In fact, your spine is one of the most vital structures in your body. Your spine is the central structure of your body that provides strength and support for your life. All of the movements, impacts, traumas, and stresses that you experience are transmitted to your spine. Your spine has to be strong and healthy to withstand this force. Your spine should also be flexible, resilient and mobile. The second major reason that your spine is so important for your overall health is the fact that your spine protects your nervous system. Your central nervous system runs through your spinal bones. For your nervous system to function optimally, your spine has to be aligned. Your spine is a protective container for your nervous system. Chiropractors are nerve system specialists. 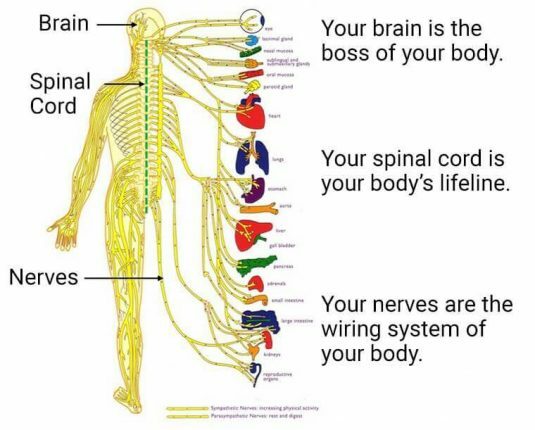 Your nervous system is the master wiring system of your body that controls and coordinates all of the functions of your body. Imagine an extremely complicated communication network that sends and receives messages to and from all of your cells, organs and body parts—automatically— thousands of times per second. This network consists of your brain(master supercomputer), spinal cord (the body’s lifeline) and nerves (wires). It is through this wiring system that your brain powers all of the processes and functions of your life. Every system—your heart, lungs, digestive organs, immune system, hormonal system, muscles, reproductive organs, liver, kidneys—is in direct communication with your brain via this complex wiring network. Click on picture for a more detailed nerve chart. To recap, your spine is a protective container for your nervous system. It is also a series of highly moveable bones that serve as the core structure of your body and guide many of the movements of your life. And because of these two important functions, your spine’s alignment is the major factor that affects your posture, health, and life. Daily stresses, like sitting for long hours with poor posture, slips and falls, sports activities, car accidents, heavy school bags, work deadlines, projects, financial worries, chemical irritants, even the birth process can cause your spinal bones to silently and painlessly misalign. Spinal misalignments are known as VERTEBRAL SUBLUXATION. Subluxations interfere with or block the flow of life through your nervous system. Like stepping on a garden hose that supplies vital water to a bed of flowers; the blockage of nerve supply caused by subluxations can be a serious problem. Spinal misalignments or subluxations also damage muscles, ligaments and the discs of your spine. When you have a subluxation, often the first thing you feel is muscle tightness or restriction in the movement of your spine. Nerve interference greatly weakens your health from the inside out; this damage can accumulate silently for a long time without pain. 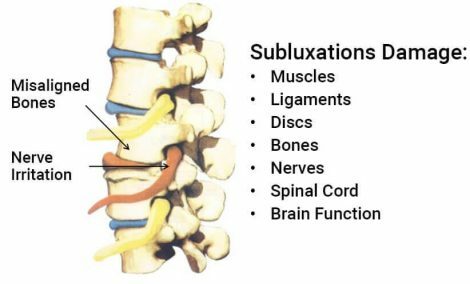 Because your nervous system controls all aspects of your health, subluxations can cause a variety of symptoms and health breakdowns. 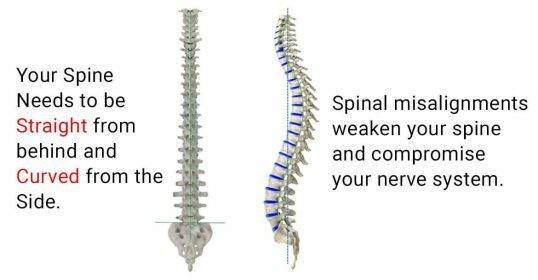 This is why a spinal misalignment is a much bigger problem than just pain. Spinal misalignments damage your nervous system and can lead to far-reaching health problems. But it is important to reiterate that, like the early stages of having a cavity, you may have a subluxation without experiencing pain for a long time. I would imagine that you are looking for solutions. A problem in your spine may be interfering with you living at your full potential. It may be as simple as neck pain or shoulder stiffness. Maybe your lower back is painful at times. It may be more than that. It may be a deeper problem. Whatever the specifics of the problems may be, the challenges you are facing are blocking you from having what you want in your life. It may be costing you time, money and energy that you could be spending with the people you care for or on what you really want to live happier and healthier. The underlying cause of this may be that your spine is out of alignment and damaging your nervous system. Through chiropractic adjustments, home exercise and possibly home traction (and other supportive procedures) we can improve the alignment of your spine and optimize the performance of your nerve system—helping you feel better and live better. We have guided and helped thousands of people for almost a decade in Singapore. At the same time, the only way to determine if chiropractic is the right choice for you is to have your spine checked in one of our offices. The checkup is a no-obligation appointment with one of our Doctors of Chiropractic designed to uncover the cause of any health problem you may be dealing with as well as to see if you’ll benefit from chiropractic care. Take action and move towards having more freedom and vitality in your life. Leave the pain, worry and frustration behind and step into a new level of vitality. Unlock your full health potential with chiropractic. Schedule for a no-obligation checkup TODAY!